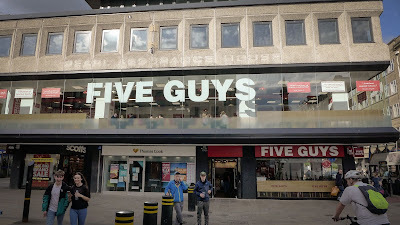 Let's start with a confession: I have a slight bias against Five Guys. In another life I quite frequently had cause to visit the West Coast of the United States. 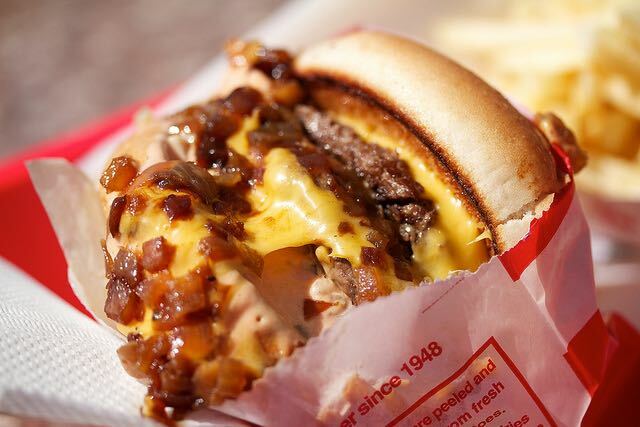 California is not only the land of never-ending sunshine, it’s also the home of the In-N-Out burger, possibly the most delicious (and evil) fast food known to man. 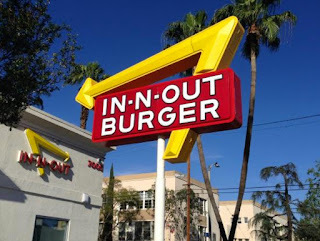 Their “Double-Double, animal style” (two patties cooked in mustard, with the sweetest caramelised onions, cheese and a secret Thousand Island-type sauce, freshly cooked and served in a ‘drive-thru’ for less than $5), could be the most significant culinary achievement of the Golden State, greater even than iceberg lettuce or The French Laundry. Well, maybe not The French Laundry. 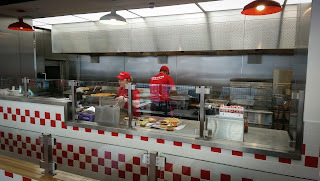 Then Five Guys arrived, an infiltrator from the East Coast, and so began the famous California burger wars. 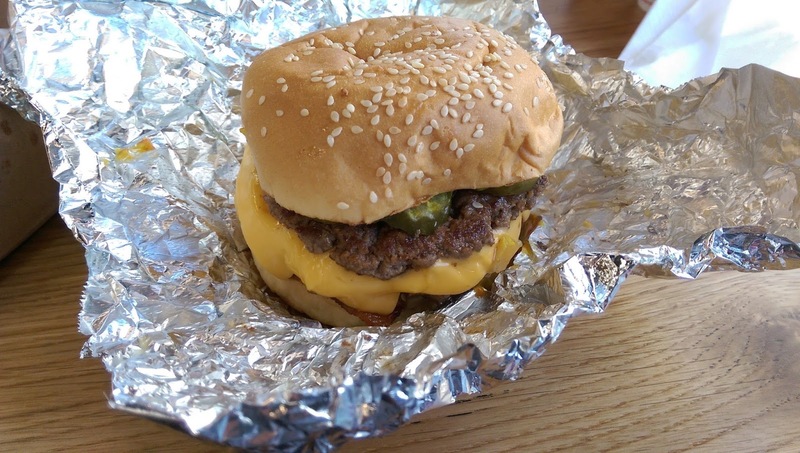 Five Guys were twice the price, but you chose your own fillings. 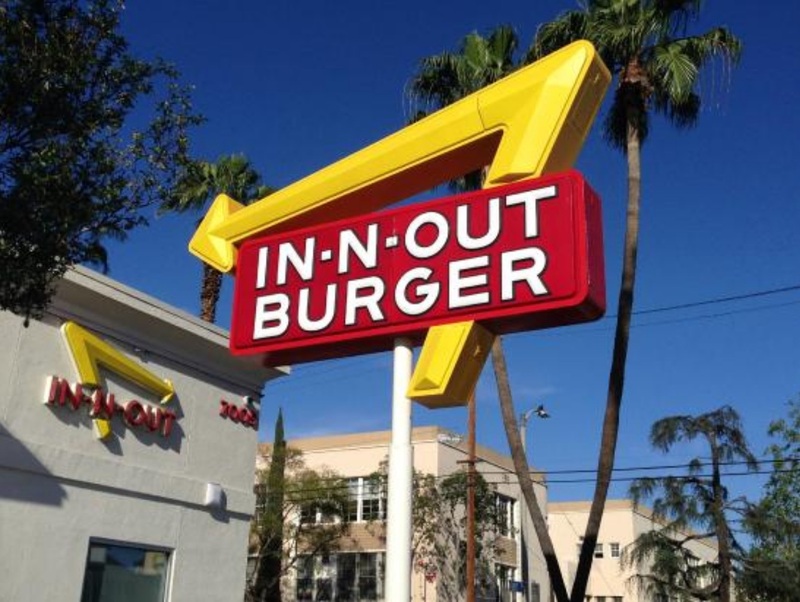 They quickly became a kind of cult, attracting the hipsters and the showy; meanwhile good old In-N-Out stayed there with just three items on the menu: burger, cheeseburger or the Double-Double. Trump versus Clinton had nothing on this: it was cultural, and it was personal. 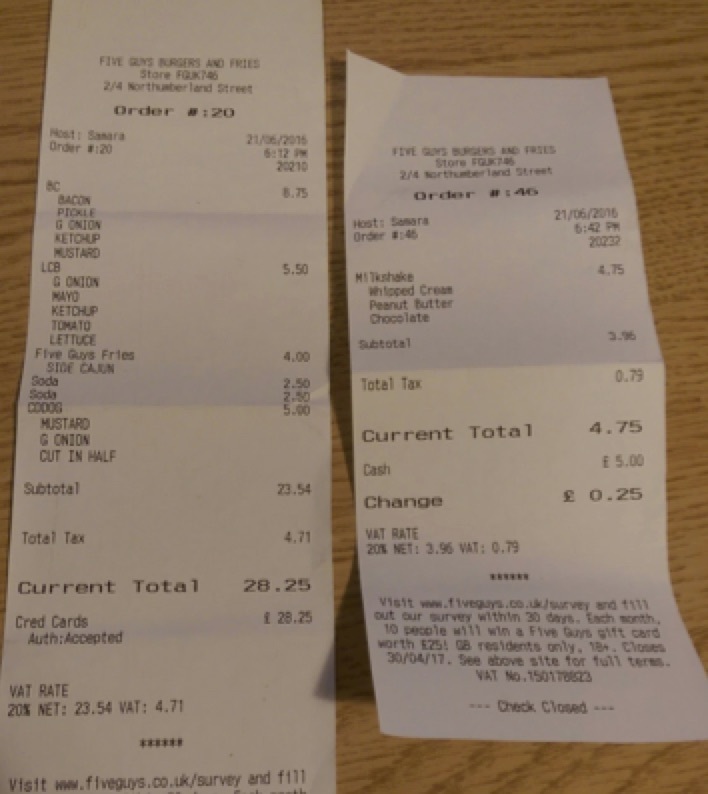 Arguments raged within families and friendships about which burger joint was better. It was like that time Oasis and Blur released singles in the same week. This was war. I was always a purist. For me, nothing beats the animal style of In-N-Out. I can’t wait for them to come to England. Except they won’t. In-N-Out is a family business, pledging never to franchise their soul or their amazing burgers. So they’ve stayed small and West Coast – they haven’t even reached New York yet. 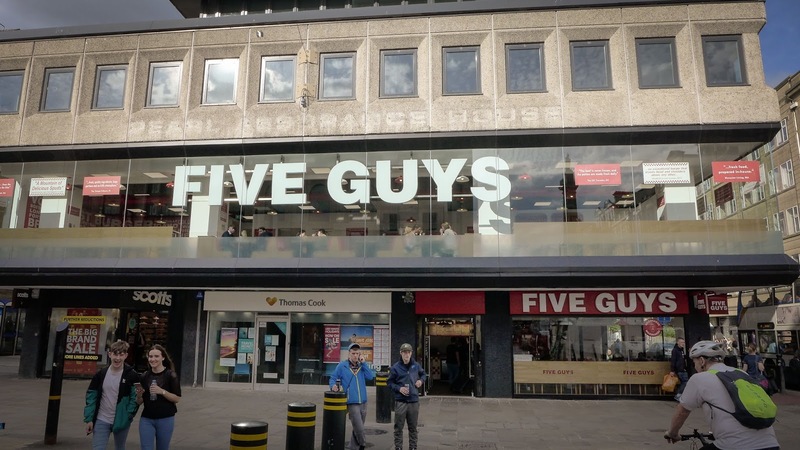 Whereas the Five Guys quickly became two thousand. Until eventually they invaded the UK. Finally, they’ve reached the North East. So, trying to suppress old prejudices, I felt I had to give them a chance. There are two on the Tyne, one in the Metrocentre, the other in Northumberland Street. It came as a pleasant surprise to find that, actually, their burgers are quite decent. In fact, I'd go so far as to recommend them. The problem is, we already have a fully functioning native burger scene. Fat Hippo (more so at the Underground branch in my experience) produces some good specimens. Lane 7, DATBar and The Tyneside Bar Cafe have excellent ones. I hear Burger Stop on the Quayside should be on my visiting list, and now we’ve got branches of Byron too. 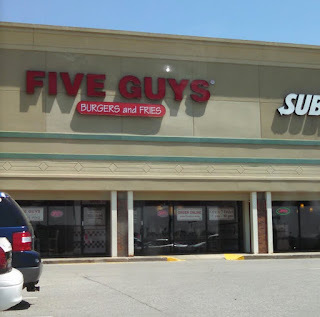 So: is there any room left at the inn for Five Guys? The qualities they’re playing up are freshness and choice. 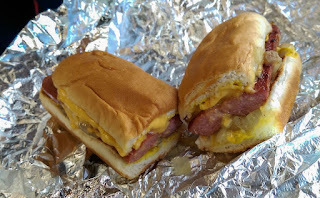 Their patties and buns are made fresh each day. Once you’ve decided what size burger you’re going for, you’re free to add whatever combination of toppings you desire. 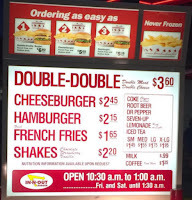 All very good, but hell will freeze over before I choose to have a slice of tomato (too watery) or lettuce (too salady) in my burger, so sometimes choice can be illusory (actually, In-N-Out put lettuce and tomato in theirs, but the whole thing is so wondrously sloppy, it all adds to the fun). There’s one of those Coca Cola freestyle machines that lets you concoct endless varieties of fizzy swill. I’d have gladly traded every damn choice on that machine for one decent glass of wine. More positively, their core burger was pretty solid, though cooked through to an unappealing grey (In-N-Out’s are pink). Yet they were still juicy, seasoned and had some beefiness to them. The standard size is a double and this makes for a meaty mouthful. 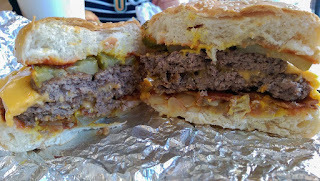 The bacon in my burger was properly crisp, the pickles added tang and the pleasingly plasticky cheese (no artisanal fromage here) provided sticky coherence to the whole experience. 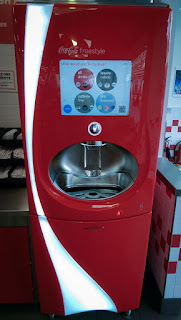 Service was super cheery at the front desk, although the whole thing about placing your order and then having to hang around the Coke machine while it’s put together is a bit odd. The fact that everything gets wrapped in foil also means the perfectly serviceable - it held together just about long enough - bun is sweaty by the time you get started. This is not a good look. Their fries, it must be noted, are excellent. Lots of crispy bits, and more substantial than your standard fast food efforts. They fry in peanut oil – I suspect its heat makes all the difference – though the menu describes it as “tasty peanut oil”, which is bang wrong. It may be cholesterol-free, but the most important reason to use peanut oil in cooking is its lack of taste. It's fundamentally un-tasty, which is a good thing. A sign on the wall tells you where the potatoes have been farmed. In the interests of research, and because I am greedy, we shared a hot dog as a sort of starter. It’s a classic beef affair and, along with cheese, mustard and grilled onions, had good flavour but it was a teeny offering for five pounds. And here’s the rub. 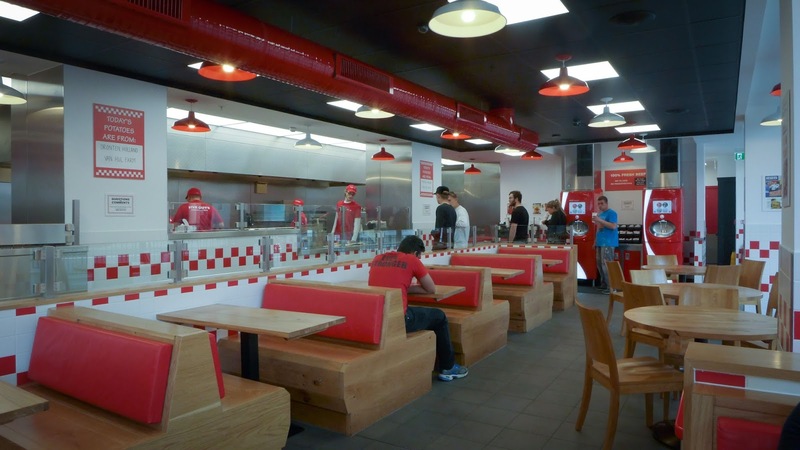 Five Guys, from the plastic interior, to the fizzy pop and the wait-for-your-own-food service, is far too expensive for what it is. 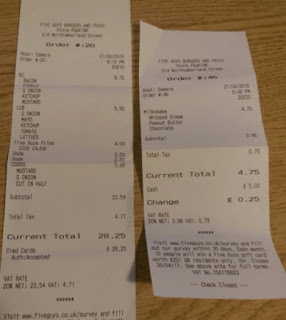 My bacon cheeseburger was £8.75, Mrs Diner’s smaller version £5.50. Normal sized fries (enough for two) were £4. Like John Travolta in Pulp Fiction I had to know what a £4.75 milkshake tasted like, so one was duly ordered. It was pretty damn good, in an artery-bothering way, but it pushed our bill to £33. 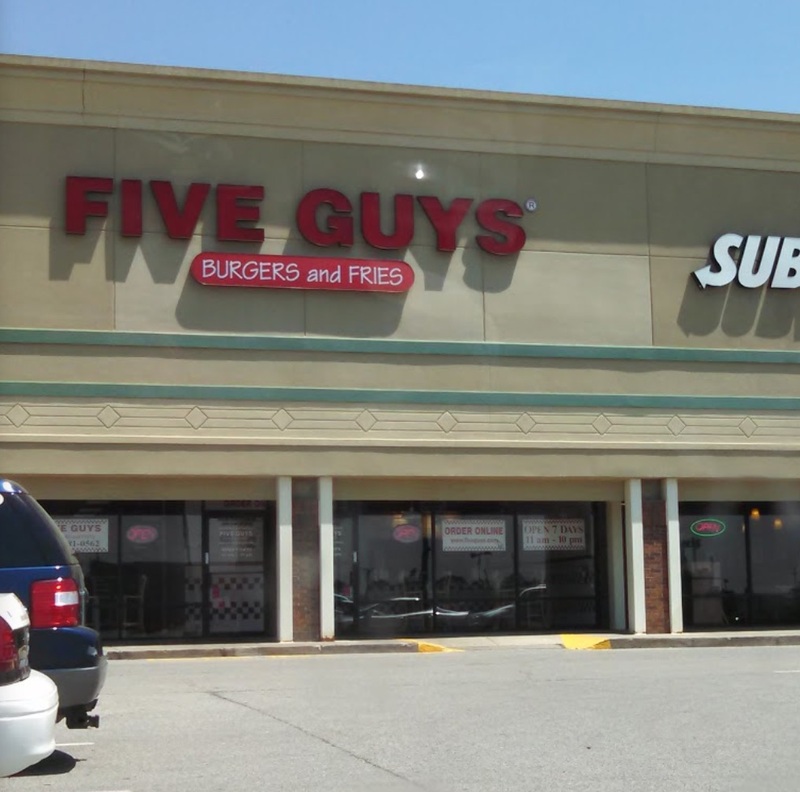 That’s an absurd number for a fast food outlet, which, at the end of the day, is all Five Guys is. If you haven’t been yet, then by all means give it a go. The music playlist was certainly excellent, taking in Nirvana, Band of Horses and Ziggy-era Bowie during our brief stay. 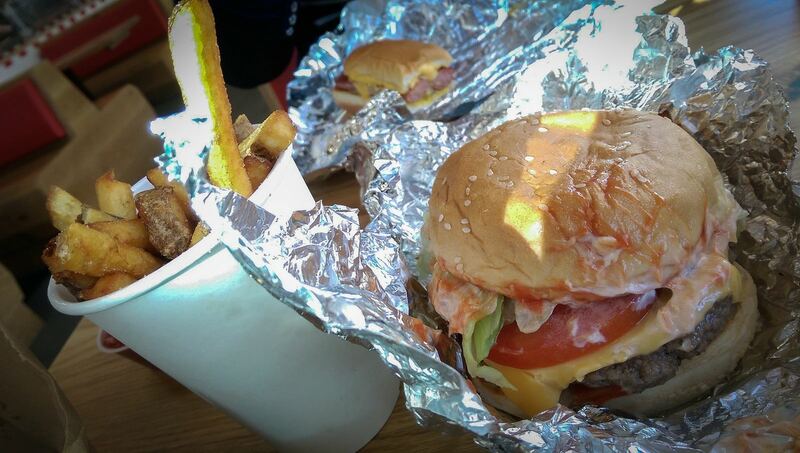 The burgers aren’t at all bad, but they’re certainly not legendary. At these prices, we have home-grown places making much better ones here in Newcastle that have wine lists and plates. 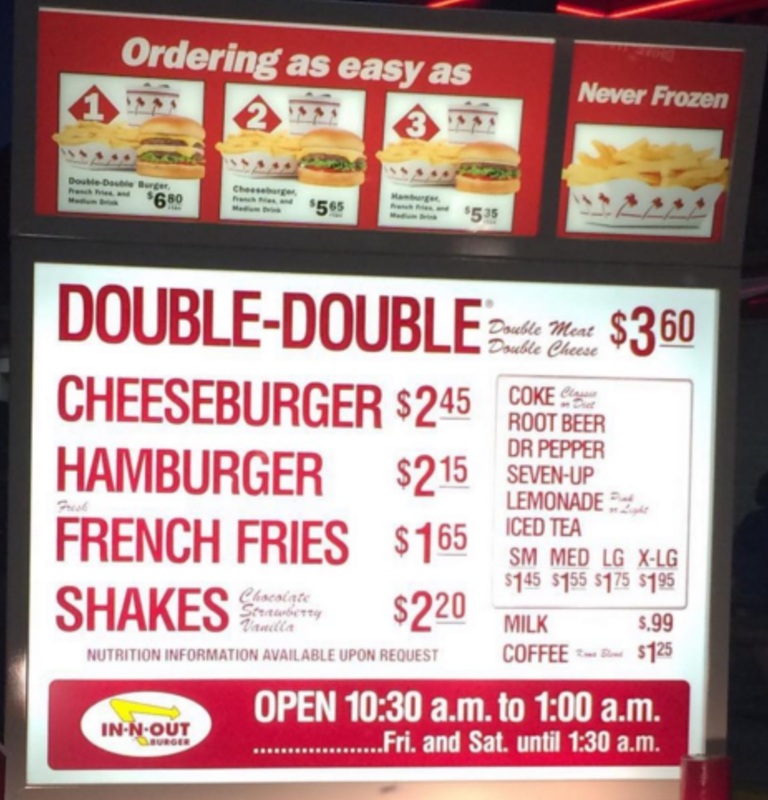 Until In-N-Out can be persuaded to cross the Atlantic, I reckon they’ve nothing to fear. I'm fairly certain Lane 7 have changed their burger since you last reviewed them. They now do 1 larger patty - I found it really poor. Fat hippo is still the leader by far. He seemed not to like hippo amazingly. It horrifies me that someone can vote Byron over Hippo. The fat hippo burger is the best burger in newcastle, with no competition. This can be evidenced by the battle of the burger. A close second is the Grind (now known as Meat:Stack). Byron is hardly a burger in my eyes.